SAN FRANCISCO — Friends and associates are mourning the untimely passing of San Francisco Mayor Ed Lee, who died suddenly on Tuesday morning at age 65. While offering condolences to Lee’s wife, Anita, and daughters, Brianna and Tania, community leaders and elected officials in the Bay Area and beyond praised San Francisco’s first Asian American mayor as an effective and well-liked politician and an advocate for civil rights. Lee, then the city’s administrator, was appointed mayor in 2011 when Mayor Gavin Newsom was elected lieutenant governor. He was persuaded by his friends and supporters to run for the office and was elected in 2011. Re-elected in 2015, he was only halfway through his second term at the time of his death. Rep. Judy Chu (D-Pasadena), chair of the Congressional Asian Pacific American Caucus, said in a statement, “A terrible hole has been created in the hearts of San Franciscans and any who had the pleasure of knowing Ed Lee as family or friend, as I did. While the sudden loss of Ed is painful, through his many achievements, he will be remembered. History will remember him as the first Asian American mayor of San Francisco. His constituents will remember him as a principled leader who, while overseeing a period of historic growth and prosperity, chose to champion the homeless and vulnerable while also making his city a global symbol of success. And I will remember him as a dear and wise friend. Rep. Jackie Speier (D-Hillsborough): “He was an uncommon mayor with a common touch, he was modest in a business that attracts boasters, he was gentle in a career that awards roughness, and he was a policy expert in everything local in a field where most of his colleagues are generalists. He led the city without histrionics or drama. 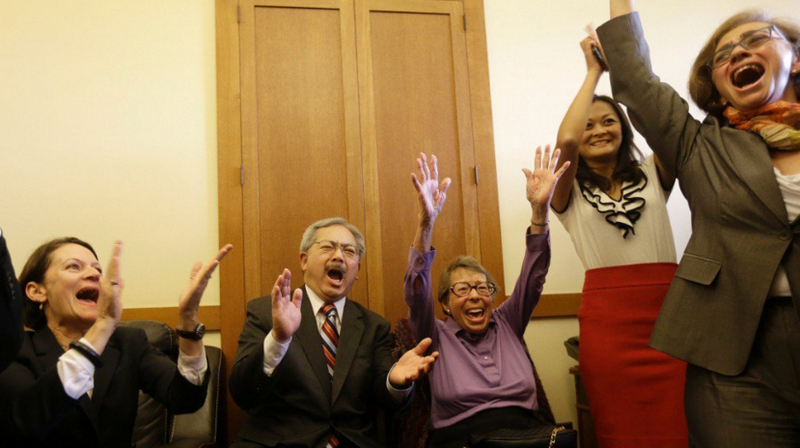 Mayor Lee was a true American leader who should be emulated and exalted in his passing. Debbie Mesloh, president of the San Francisco Commission on the Status of Women, said: “Mayor Lee was a dedicated public servant and served our city for decades with commitment and determination. He was a champion for women, making gender equality and support a key priority of his administration. “Under his leadership, San Francisco became the first city in the country to approve fully paid parental leave, and he was stalwart for the prevention of violence against women. He prioritized funding for the Violence Against Women Prevention and Intervention Grants program, which supports 39 community-based programs throughout the city, and continued this commitment year after year. During his tenure, San Francisco eliminated domestic violence homicides for almost four years. He also invested millions in subsidized child care for our low-income families and called for implicit bias training for all city staff. “In 2016, Mayor Lee convened the 2016 Bay Area Women’s Summit to encourage public and private sector initiatives that would improve economic and social opportunities for women in San Francisco and the region, and a myriad of tangible improvements came a result of this convening. During Women’s History month in March of this year, he called for a second convening in 2018. Dr. Emily Murase, director of the San Francisco Department on the Status of Women and a member of the San Francisco Unified School District Board of Education, said, “We have lost a giant in the women’s human rights movement. Mayor Edwin M. Lee launched the Cities for CEDAW campaign during Women’s History Month in March 2014 to encourage other mayors to adopt the principles of the UN Convention on the Elimination of All Forms of Discrimination Against Women, an international bill of rights for women.